The city held a naming ceremony Monday that included members of the Musqueam, Squamish and Tsleil-Waututh nations, who helped the city come up with the names. The City of Vancouver has given Indigenous names to two of its downtown plazas. The plaza adjacent to the Queen Elizabeth Theatre is now šxʷƛ̓exən Xwtl'a7shn. The name is linked to the plaza's past use as a gathering place for the Walk for Reconciliation. 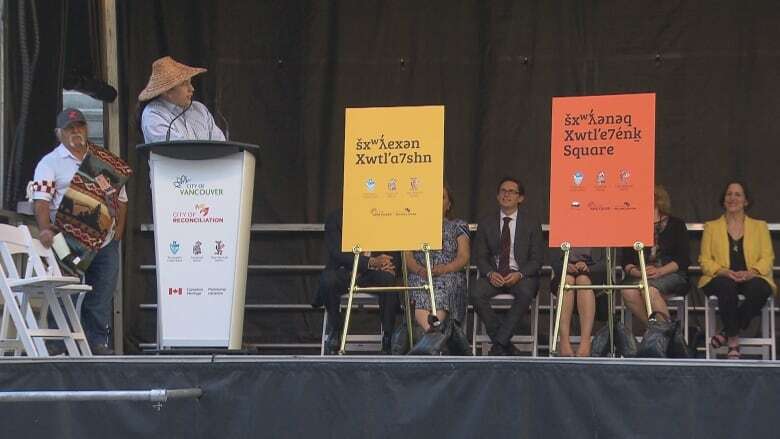 The Vancouver Art Gallery's north plaza has been named šxʷƛ̓ənəq Xwtl'e7énḵ Square, which refers to a place for a cultural gathering such as a wedding or funeral. The city held a naming ceremony on Monday with members of the Musqueam, Squamish and Tsleil-Waututh nations, which helped the city choose the names. "This is the beginning of the first steps of a long path," said Gabriel George, manager of culture and language for the Tsleil-Waututh Nation. "In 150 years, your children or grandchildren or great-grandchildren will know these names and be a little bit familiar with the languages of this territory." City council pushed for the names as part of Vancouver's reconciliation efforts. The names each use hən̓q̓əmin̓əm̓, the language of Musqueam and Tsleil-Waututh, and Sḵwx̱wú7mesh, the language of the Squamish Nation. "Vancouver is committed to a new partnership with Musqueam, Squamish, and Tsleil-Waututh that's based on mutual understanding and respect and on caring for these lands and waters," Mayor Gregor Robertson said in a statement. The city said it's working with the three nations on signage designs for each plaza. The markers should be ready by the fall.